Original utility developed by Antoine Vignau. That utility has been developed by Antoine Vignau when he was a member of the HackerForce team. Its objective is to offer 40/80-column, GR, DGR, HGR and DHGR screen making routines. As a member of a cracking band, we needed a tool to make our introduction screens, that utility fulfilled the need. There are different versions, I cannot tell the differences between them, just download! 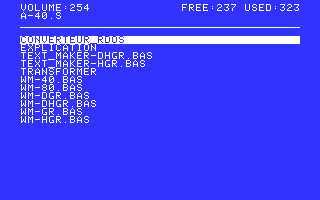 80-column, DGR and DHGR routines do not work well with emulators. My rDOS 3.2 to rDos 3.3 program is also included.